Osprey villa has gorgeous sunset views and outdoor amenities perfect for a family vacation. The waterfront location is enhanced by a seaside deck, kayaks, and an oceanfront gazebo. There’s a children’s pool, a larger pool, and a hot tub right outside the villa so everyone can soak up the sunshine. The villa’s U-shape gives nearly every room an ocean view, and the children’s suite has two twin beds that siblings will love. Osprey villa has something for everyone and that’s why it’s such a great choice for families. The palm tress, green foliage and bougainvillea surrounding the pool create a soothing tropical oasis where mom and dad can also relax and enjoy family time. 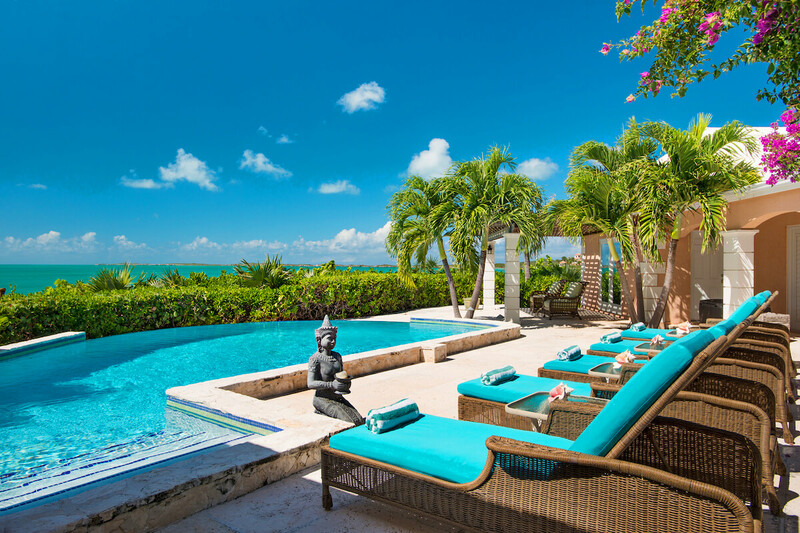 Villa Osprey is a charming 3-bedroom vacation rental in the Silly Creek area of Taylor Bay on the south side of Providenciales. This family-friendly property sits on an acre of oceanfront land with several spots to relax and take in the view. The generously-sized swimming pool is framed by the patio and the hot tub, all with a panoramic ocean view. Cozy up in the loveseat by the pool with a drink in hand to watch the sunset, or dine al fresco in the gazebo. Kids will love the children’s pool, and everyone will want to walk down the stairs to the oceanfront deck to stick their feet in the sea. The stairs also lead to the cliffside gazebo, the perfect place for romantic dinners. There are two kayaks to take on the water, so guests can explore the coastline. The villa curves around the terrace in a U-shape, so nearly every room has a view and provides privacy for guests. Guests can watch TV on the flatscreen in the living room and stay cool under the ceiling fan, then prepare dinner in the spacious kitchen. Enjoy the meal at the polished dining table, with traditionally Caribbean rattan chairs. Osprey has two master suites with king-sized beds and ensuite bathrooms. The guest suite has two extra-tall twin beds that can be converted to a king, and a full ensuite bathroom. One of the king suites and the twin suite are connected via the laundry room, and all three of the suites have exterior access. Taylor Bay is home to only a few private homes with private access to the stunning white sand beach. Las Brisas restaurant is a few minutes drive and Sapodilla Bay and Chalk Sound are also just minutes away, so guests can visit several different bays in a day and never be too far from home. 1 minute drive or a 5-10 minute walk to beautiful Sapodilla Beach. Upon arrival guests will be met at the airport by a member of the villa management team. After securing their rental vehicle or taxi the guests will follow them back to the villa. Car rental, private chef, butler, server, daily maid service, grocery and beverage shopping (pre-arrival and during your stay), liquor and wine delivery, nanny service, baby equipment, spa services, yoga and personal training, photography, and private airport transfer/car service can be arranged for an additional fee. Metered A/C is available throughout the villa for approximately $0.49 / KW hour.